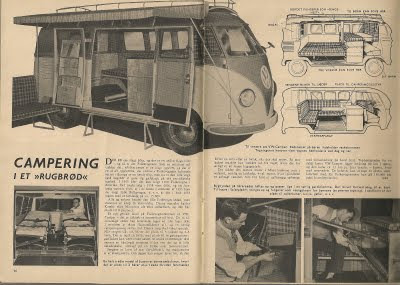 The Sechs volt Garage Blog: Summer vacation 1955 - camping in a "ryebread"
Summer vacation 1955 - camping in a "ryebread"
Everybody knows the little Volkswagen sedan, but its big brother its not that common. This brother is called Kombi- or Microbus according to its finish. A new, genius model is now availlable - the vw-camper - a summerhouse on wheels! When the seats are turned in to beds, this camper will house 3 adults and 2-3 kids. The camper utilize the same powerplant as the sedan, an air-cooled, horizontal 4-cylinder engine. The top speed for a fully loaded VW-camper is about 80 km/h, giving approx 11 km’s per liter of fuel. …..I know which car I would have bought if my VW-dealership could offer a factory-fresh, camper barndoor today! I guess the family structure was a bit different back then, considering the camper is equipped for 3 adults and 2-3 kids... Or is there a special seat for the mother-in-law?